on 5 August 1950. At the time of his death, the general was commander of the 9th Heavy Bombardment Wing and was the base's commanding general. Formal dedication ceremonies were held on 21 April 1951. On 01 May 1949, the Strategic Air Command became the parent major command for the base, turning it into a major long-range reconnaissance and intercontinental bombing installation. 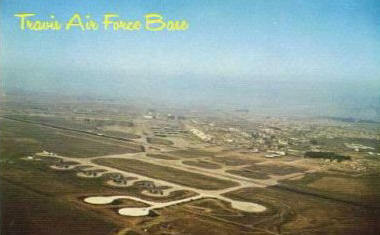 For the next nine years, airlift operations became secondary while the base served as home for SAC bombers such as the B-29, B-36, and eventually, the B-52. During this period, new hangers appeared, runways were added and widened, and permanent barracks and family living quarters were built. The base grew to its present size which encompasses 6,258 acres. 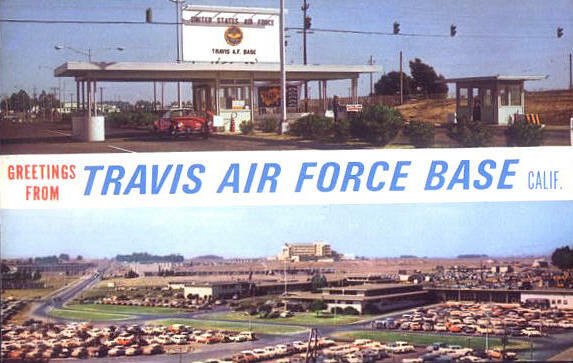 Military Air Transport Service resumed command of Travis AFB on 1 July 1958, after SAC's new dispersal policy led to the transfer of the 14th Air Division to Beale AFB, California. Known as the "Gateway to the Pacific," Travis handles more cargo and passenger traffic through its aerial port than any other military air terminal in the United States. Additionally, the base has had a long and proud history of supporting humanitarian airlift at home and around the world. Today, the Travis Team includes approximately 7,260 active military, 3,770 civilians, and 4,250 reservists.